Text boxes are interaction objects into which learners can enter text. They are a good way to test learner knowledge and collect information. To insert a text box, click the Interactions tab > Text Box. Alternatively, click the Home tab > Interactions > Text Box. By default, a text box consists of three separate elements: (1) a target area, (2) a Correct message, and (3) an Incorrect message. When the interactive presentation is played, the text box displays only the target area and waits for learners to enter text strings. If the entered text matches the correct value, the Correct message appears, otherwise the the Incorrect message appears. When learners enter a text string, it appears in real time in the target area. If the entered text exceeds the area, the text is shifted so that the insertion point is always visible. You should resize the target area to appropriate size so that all the text can be visible. For submission, see below in the Setting Score and Reporting section. When you record software simulations, text boxes are inserted automatically whenever you enter a text string. For full details, see Question Score & Reporting. 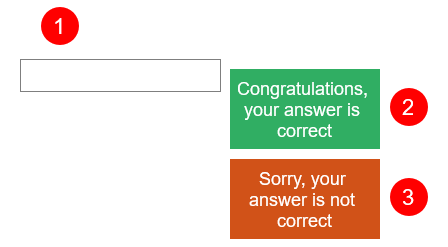 By default, text boxes use the graded mode which validates learner input as correct or incorrect. To disable validation, set the mode to survey. This may be useful when you want to collect learner name or other information. There are two ways to submit the entered text: the Submit key (Press Key) and Auto. (The survey mode only accepts the Submit key.) The former validates the entered text when learners press the Submit key. Meanwhile, the latter validates the entered text whenever learners press any key. As long as the entered text is a partial match for the correct value, the presentation will wait for learners to input more text. The moment the last entered character is found to be different, it will be deemed as incorrect. 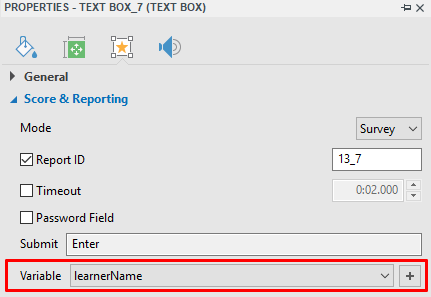 You can assign text and number variables to text boxes to store learner input. Then, you can use references to display variable values anywhere in your presentation or use actions to adjust variable values. For details about variables, see Adding and Using Variables. Step 1: Select the target area element. Step 2: Click the Properties pane > Interactivity > General > List of Correct Values > Add Value (4). Step 3: Type a text string in the Correct Value text box to define a value. If you don’t want a value anymore, click the Remove button (5) next to that value to remove it. 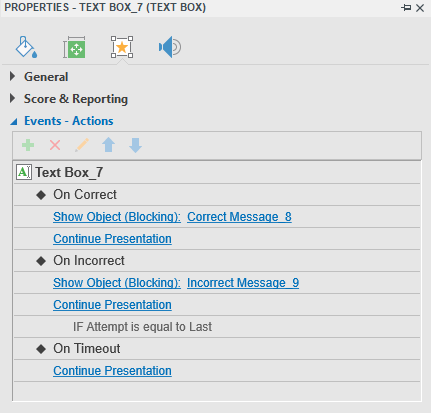 To set up events and actions for the text box, access the Events – Actions section in the Properties pane. By default, text boxes have three events, namely On Correct, On Incorrect, and On Timeout. You can add four other events, namely On Text Enter (occurs when users enter a text string), On Incomplete, On Rollover, and On Rollout. For more details, see Working with Events – Actions. Besides the Correct and Incorrect messages, you can optionally add the Timeout and Hint ones. Select the target area and click the Interactions tab > Message > choose the message you want. Of course, you can remove any unnecessary messages. For more details, see Working with Feedback Messages. 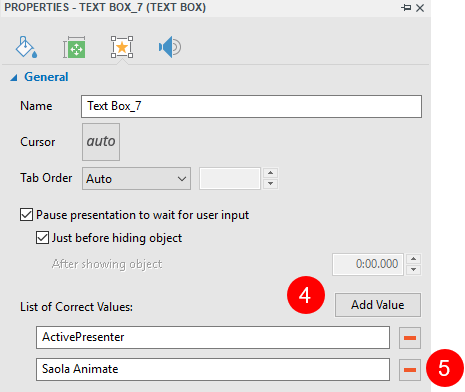 That’s all about text boxes in ActivePresenter. Feel free to contact us if you need any help.